LAIKA is a magazine and a modern guide to vegan living. Mink farm in Ontario, Canada. Photo by Jo-Anne McArthur/WeAnimals, 2014. The thrill of glimpsing a wild animal in their habitat is as much in our true nature, as it is in the animal’s to desire freedom. We are a culture of Planet Earth documentaries, awed by the unbridaled beauty of the animal kingdom. Yet on fur farms, those same animals endure the indignity of captivity so severe it strips them of all the natural behaviors we find so enthralling. In this time of our heightened awareness of societal injustice, mindfulness can extend to what we eat and wear. As a moral species, we have long acknowledged that inflicting suffering on sentient beings for trivial means is wrong. Fur, and other materials that are the products of oppression, therefore have no place in the modern wardrobe. Now is our opportunity to literally wear our wokeness on our sleeve. Fueled by increased demands in developing economies of Russia and China, the fur trade has in recent decades grown into a global multi-billion dollar industry. But this momentum is showing signs of slowing, and Europe has experienced groundbreaking political and legislative developments, with fur farming now banned in eight countries. 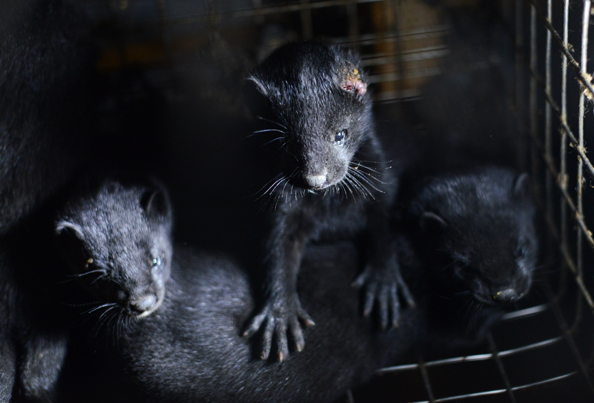 Among them is the United Kingdom, where it’s been outlawed since 2000; the long-awaited Croatian fur ban came into effect last month; and the Dutch Supreme Court recently upheld a mink farming ban in the world’s fourth largest fur producer, the Netherlands. Japan has closed its last fur farm, and New Zealand has a partial ban. But the fur machine churns on. 125 million rabbits and 75 million mink, foxes and raccoon dogs are killed for fur each year in China. 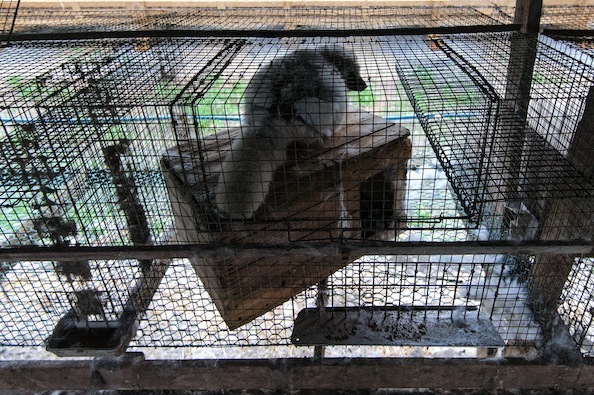 On fur farms in the European Union, over 32 million animals per year are killed for fur year-round. In the US and Canada, where trapping is the norm, over 7 million fur-bearing animals are slaughtered annually. In this story, LAIKA speaks to some of the witnesses, activists and experts who are determined to bring those numbers down to zero. “The fur is everywhere,” says photographer Jo-Anne McArthur. She is speaking to LAIKA from Scandinavia, home to fur giants Saga Furs and Kopenhagen Fur. “Some people don’t even know that animals are killed for their fur coats,” she says. “What I see is the death of a hundred individuals.” McArthur has seen more than most. By her estimate, she has documented twenty five fur farms in Europe and Canada. Mink farm in Quebec. Photo by Jo-Anne McArthur, 2014. The farms are typically situated in forests. For the animals, it’s freedom that’s close, yet hopelessly out of reach. “They can feel the breeze … There’s trees surrounding the cages, and they just look at that day in and day out,” says McArthur. She describes the filth and unbearable stench of their immediate surroundings, the excrement piled high underneath, the cages caked with fur and dust. Mink factory farm in Nova Scotia, Canada. Photo by Jo-Anne McArthur, 2014. And whether the farm is new or old — “it’s hell,” says McArthur. “If you could see what I’ve seen, you would never wear that coat.” In addition to mink farms, she has documented fox farms, one of which also kept raccoon dogs. In the wild, these animals (who are in the same family of species as domesticated dogs) live in densely vegetated areas, roaming vast distances. Fox fur farm in Quebec, Canada. Photo by Jo-Anne McArthur/WeAnimals, 2014. 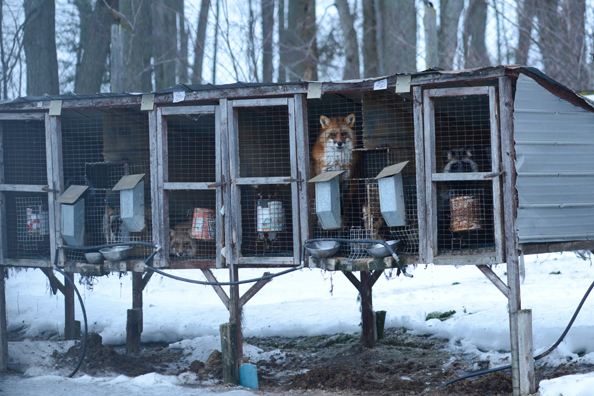 On fur farms, they “have zero autonomy,” McArthur says. “They can’t choose their friends, they can’t choose their mates. The loneliness that they must endure.” The wooden structures they’re housed in are often worn down from chewing, which results in severe mouth injuries that go untreated. “These animals spend a lot of time circling trying to find a way out,” she says. These and other stereotypic (abnormal repetitive) behaviors, like fur chewing and self-injury, are a sign of psychological dysfunction and a common sight on fur farms. Many animals simply succumb to despair. “They’re just really despondent and sort of beyond fear,” McArthur says. 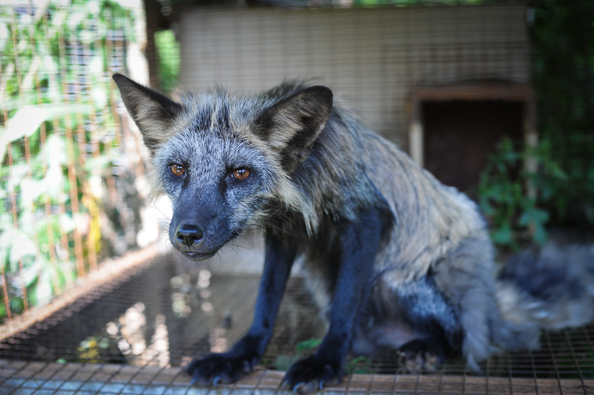 A starved fox on a fox fur farm in Quebec that was the site of horrific abuse. Charges were brought against the fur farmer. Photo by Jo-Anne McArthur/WeAnimals, 2014. Rescued coyote at Lockwood Animal Rescue Center. Photo by Jennifer MaHarry. The coyotes caught with leg hold traps for Canada Goose, and other companies that use fur, sustain injuries like severance of tendons (caused by animals twisting their limbs to free themselves), limb amputations and profuse bleeding, among many others. Traps may go unchecked for as long as five days, as the animal suffers from thirst, starvation and fear. 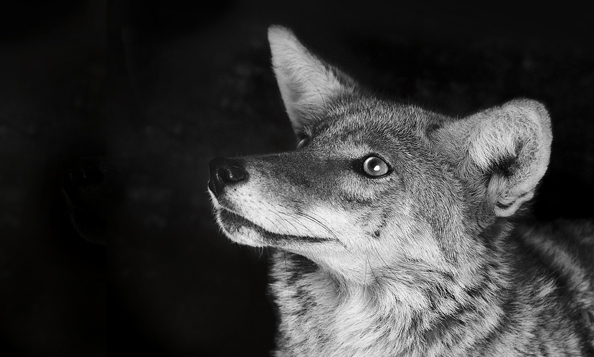 To preserve the pelt, instead of being shot, the coyotes found alive by trappers will be clubbed, suffocated or strangled with a snare — a metal noose that delivers an agonizing death that can last eight minutes. Canada Goose obsessively claims that its $900 jackets, favored by city-dwelling celebrities and status seekers, provide “functionality,” yet there is no scientific proof that fur trim or down are a requirement for warmth. High performance synthetic materials have been sufficient for even subarctic expeditions. The coyotes slaughtered for those jackets are also North American icons — called “God’s dog” by the Navajo. Like our beloved pet dogs, they are members of the genus Canis. 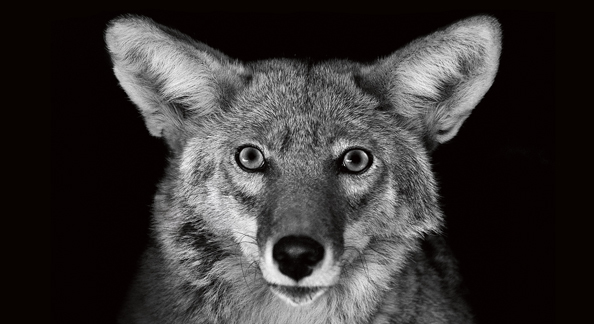 In LAIKA’s issue 6 feature “Kindred Creatures,” Camilla Fox, founder of Project Coyote (no relation to Lesley Fox), explained that the animals maligned by Canada Goose as “pests,” are in fact a keystone species that plays a vital role in a thriving ecosystem. Activists in Canada face steep hurdles, among those an absence of federal labeling laws: retailers are able to market the fur of dogs, cats, rabbits and other animals as “faux fur.” (“It can be difficult for some consumers to know what is fake and what is real,” says Fox.) The Fur-Bearers, however, make gains on the municipal level, working with individual communities to end their use, and support of, trapping. “Several municipalities in British Columbia have enacted or requested permission from the Ministry of Forests, Lands and Natural Resource Operations to prohibit trapping as a direct result of this campaign,” Fox says. And there is an upside — many Canadians feel a strong connection with nature, because of how accessible it is. “That makes the discussion of introducing new ideas regarding the sentience of wildlife a little easier,” explains Fox. Educating the consumer dwindles demand, as evidenced by sporting goods giant Canadian Tire recently dropping fur at two of its subsidiaries. Atmosphere, one of the stores that stated they will not stock fur, except for their Quebec stores, was a long-time carrier of Canada Goose. In New York, where Canada Goose opened its U.S. flagship last fall, a passionate grassroots initiative has been ignited. Protests in front of the Soho store are a weekly occurrence, and two Anti-Fur Marches have taken place this winter. Posters and stickers bearing the Canada Goose logo with the slogan “Proudly torturing animals since 1957” and “Fur trim kills” are a common sight on buildings and bus stops in NYC and have made their way to other parts of the world. “Our main focus is to change the way the general public looks at fur,” says organizer Rob Banks. “This issue needs to be handled on different levels — we fight on the streets, educating the public, while others fight to get laws changed.” Through their Facebook page “Stop Canada Goose Now,” Banks and fellow activists share prints, exchange ideas and help activists in cities around the world set up demos. On Instagram, #fuckCanadaGoose appears thousands of times, and even Canada Goose’s own hashtag #AskAnyoneWhoKnows has been overtaken by anti-fur posts. 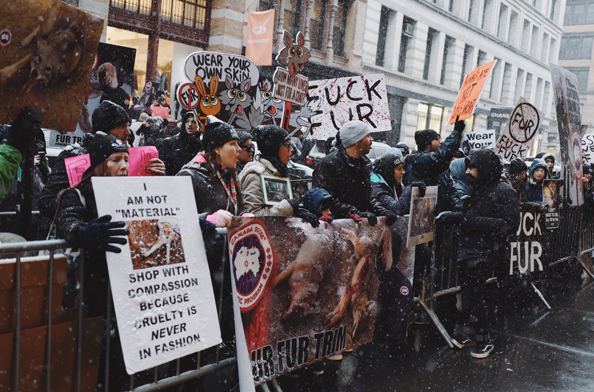 Protestors gather in front of Canada Goose’s NYC store, following the Anti-Fur March in January, 2017. Photo by Kenny Wong. The creative video’s goal was to strike a chord with young people who may otherwise turn away from graphic imagery. “We wanted to trigger them to think for themselves,” explains Bont voor Dieren’s campaigns manager Barbara Slee. The organization teamed up with Reclamebureau Roorda, a Dutch agency with a string of successful anti-smoking and anti-drinking campaigns targeting kids. They brought an understanding of the science behind behavioural changes resulting from visual campaigns. “The ad agency came up with the idea of showing how important pets are to people, especially children, and to show the contradiction in wearing a fur trim when you’re older,” Slee says. To the video’s young director, 23-year-old Joren Molter of production company The Boardroom, authenticity was imperative. “I was looking for real moments between animals and kids,” he says of his decision to not use actors. Molter and his cinematographer Tijn Sikken interviewed regular children at home about what they normally do with their pets. The resulting video captures their genuine interactions. To safeguard its tremendous economic interests, the fur trade has been pushing back with “ethical branding” and “greenwashing” strategies. 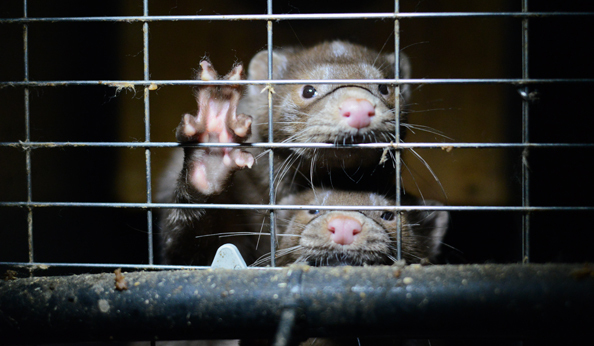 The industry-funded WelFur project promises to ensure high animal welfare standards in fur production — an unattainable goal according to ethicists and welfare experts, due to the inherent problem of confining wild animals to small cages which prohibit essential behaviors like running, climbing and swimming. Norwegian fox fur farm, 2012. Photo credit: Network for Animal Freedom/Norwegian Animal Protection Society. While marketing its products as ethical, Saga Furs (one of the world’s largest fur auction houses) is covertly very active in China, where animal welfare legislation is extremely limited. “The fur industry’s PR strategy has taken a more sinister turn using similar tactics as the tobacco industry by introducing its version of science in its defense,” says Brigit Oele, program manager of the Fur Free Alliance (FFA), a coalition of 40 international animal protection organizations (the aforementioned Bont voor Dieren and The Fur- Bearers are members.) They share resources and tactics, and collaborate on research projects and campaigns. FFA has successfully persuaded a number of luxury retailers to go fur free, including the Armani Group and Hugo Boss, and works as a “united front” to end the fur trade worldwide. The European countries that have enactied fur bans, Oele says, “Are an example of how, in a modern civilization, the public’s ethical concerns are reflected by law.” And she believes that gains in the anti-fur movement will inevitably benefit animal rights as a whole.“We often see that progress in one area stimulates discussion on other areas in which animals are used for human benefit,” says Oele. While there are now far fewer fur outlets in the UK, there is a recent proliferation of fur trim, which many people wrongly assume is fake (this is one of the reasons that none of the organizations we spoke with overtly promote faux fur. “If something is deemed immoral, why would you want to imitate it?” says Glover.) Along with calling for clear, prominent labeling, Respect For Animals and their Fur Free Alliance colleagues, will be rolling out a range of initiatives to counter the fur trade’s propaganda. A lonely fox in her small cage on a fox fur farm in Denmark, 2010. Photo credit: Fur Free Alliance. Donate your fur coat or item with fur trim to be as used as comfort for orphaned and injured animals as part of their rehabilitation. Coats for Cubs is a great program, and you can drop off your item at any Buffalo Exchange location. You can also donate directly to wildlife centers that use fur for rehabilitation. Born Free USA is a fantastic organization that also offers a fur donation drive. Although their drive cycle has already ended, you can still donate to their partner sanctuaries. Swap out your fur garment with a hi-tech vegan one. Wully Outerwear is a Canadian company that offer a $300 discount on any of their parkas when you trade in your Canada Goose (or any similar jacket with fur trim). There are many other functional and beautiful alternatives like Save The Duck; The North Face has vegan collections fit for extreme weather; Vaute; Arc’Teryx is another outerwear fur-free brand with many vegan options. The list goes on. Get active. Whether educating those around on the inherent cruelty of fur production, or attending a protest, or getting involved with one of the organizations mentioned in this story, or asking a store in your neighborhood to stop stocking fur because they are losing your business — there is a myriad of ways in which to speak up for animals. And remember, you’re not alone. David and Piopito at Santuario Igualdad Interespecie in Chile. Photo by María Gabriela Penela. For thousands of years, the human species has relied on the exploitation of our fellow inhabitants on Earth – the nonhuman animals. It has long been our society’s status quo, the norm. There are over 7.5 billion people on the planet. 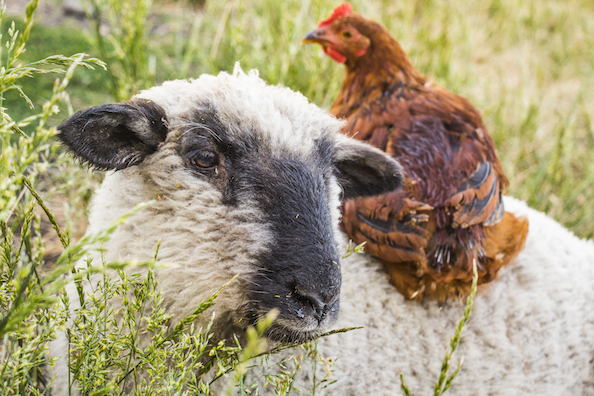 Nearly eight times that many farm animals are killed by humans annually. But what if the use of animals was no longer part of the equation? Over 56 billion animals are raised and slaughtered for human consumption each year. This figure doesn’t include marine animals, whose deaths are measured in tons. Together, approximately 150 billion animals’ lives are taken by the meat, dairy, egg and fish industries. Billions more are destroyed, injured and deprived of freedom by the fashion, entertainment, sports and animal testing industries. The abolition of animal exploitation would bring an end to the cycle of breeding and raising animals for the sole purpose of killing them. No longer would nonhuman animals be subjected to agonizing (yet standard) practices like forcible insemination, intensive confinement, tail docking, dehorning, beak trimming, being auctioned off as babies, gassed, electrically stunned, processed while alive. Traumatic events such as separating children from their mothers within 24 hours of birth would no longer be routine. Transport trucks full of animals stop criss-crossing nations; there would be no more live export by sea or air. Fish would no longer endure the despair and severe depression of farming. Our relationship with animals would be completely transformed from one of dominance to one of co-existence and respect. Their depth of sentience and sophisticated cognitive abilities would be an undisputed fact, and our treatment of them would be universally acknowledged as having moral significance. We would understand the animal kingdom as never before; sharks would no longer be vilified, and farm animals would not be reduced to objects. Nonhuman animals would no longer have the status of commodities, but of conscious beings with the inherent right to be free from bodily harm. 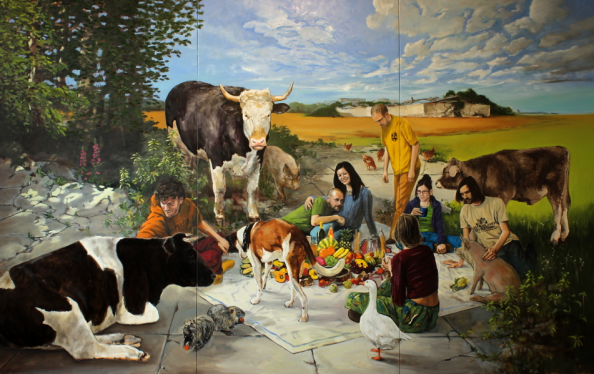 “Large Picnic” by Hartmut Kiewert, 2015. The toll of animal agriculture on our planet is brutal. 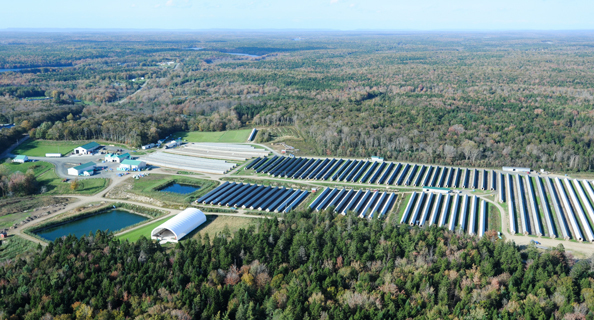 The meat and dairy industries have been identified as major accelerators of climate change: animal agriculture produces more greenhouses gasses than emissions from all forms of transportation combined. Today, close to 80 percent of the Amazon’s deforestation is the result of land clearing for cattle ranching. With animal agriculture made obsolete, global CO2 emissions would drop spectacularly. A world of herbivores would mean that our individual dietary greenhouse gas emissions would be cut in half. In a vegan world with more available land, biofuels would replace half of the coal used worldwide, which is currently responsible for about 3,340 million tons of CO2e emissions annually. Rainforests play a crucial role in absorbing our world’s carbon dioxide, converting it to oxygen. In a vegan society absent of animal agriculture, the Amazon — the “lungs of the planet,” as it’s known — would be restored to its healthy density. No longer would trees be burned to clear land, releasing carbon dioxide into the atmosphere in the process. Global warming would be de-escalated. With humans no longer wearing the skins of nonhuman animals, our Earth would be spared the dumping of chromium-laced waste and other dangerous pollutants into water systems by the leather industry. Instead, our clothing, shoes and accessories would be made from materials like repurposed plastic waste and waste plant fibers. 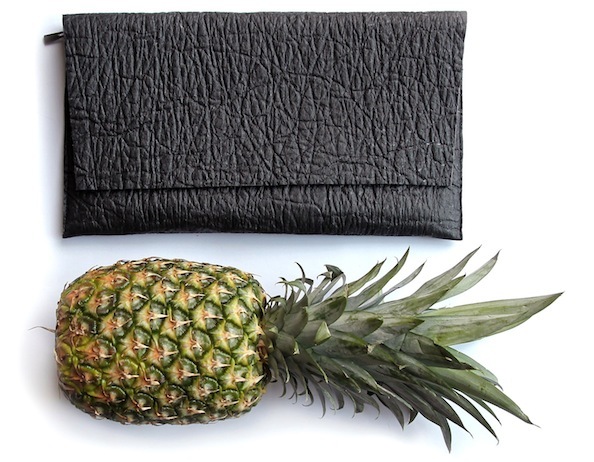 Vegemoda vegan bag made from pineapple leaves. 1 in 9 people around the world face water shortages. The water crisis is the #1 global risk based on impact to society, according to the World Economic Forum. A third of the world’s water consumption goes towards producing animal products. In a society without meat production, each former beef eater would save our planet nearly 130,000 gallons of water a year. The dairy industry’s catastrophic water footrpint (109 gallons to produce just one stick of butter) would be reversed in a vegan world. Without industrial-scale animal exploitation, our water supplies would no longer be in danger of being polluted and made unsafe for human consumption by the frequent leakage of animal waste “lagoons” and fertilizer runoff. No longer would vast regions be affected by the disastrous manure spills of factory farms. Thanks to the end of the meat industry, communities would be safe from waterborne disease outbreaks caused by pathogens or having their drinking water poisoned by toxic pollutants like nitrogen. With animal products obsolete, climate change would be abated; rising temperatures and the depletion of groundwater reserves due to drought would come to a standstill. The bulk of industrially produced grain crops goes to confined animal feedlots instead of the 1 billion humans currently suffering from starvation and malnutrition. Over 50 percent of the corn grown globally, and 80 percent of soybeans, are consumed by animals farmed for their flesh. Yet it takes roughly 13 pounds of grain to produce just one pound of meat. Twenty-five times as much edible human food is being used to produce just one unit of meat. In a vegan society, all field crop production that would have been used to raise animals would now meet the nutritional needs of the global population. It is estimated that by 2050, an additional 4 billion people could be fed with the annual energy value used to produce meat. Doing away with animal agriculture would free up land and resources, enabling communities to sustain themselves and making food sovereignty a reality. In the place of industrial-scale animal exploitation and slaughterhouses, there would be community farms and gardens, more schools and cultural institutions. The systematic decades-long clearance of trees from the Amazon has condemned close to 40 species in the region to near extinction. And in the Southwest of the US, livestock grazing is the most widespread cause of wildlife endangerment. Not only do wild animals suffer from deforestation and climate change caused by the meat industry, but they are also killed en masse to protect its corporate interests. Keystone predators like California grizzly bears and Mexican gray wolves have been driven to extinction as a result of “predator control” programs. 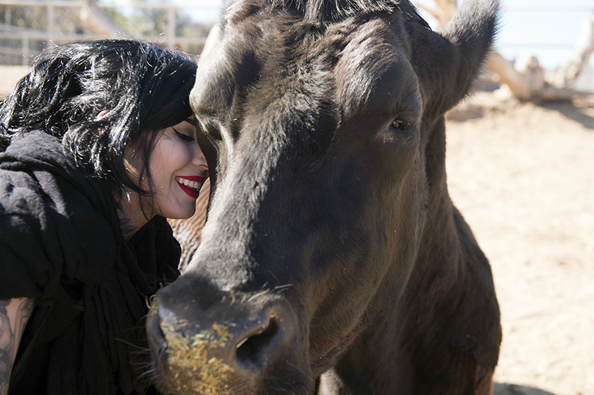 Kat Von D and Bruno, who was rescued as a calf after falling off a transport truck to the slaughterhouse. From LAIKA, Issue Six. Photo by Melissa Schwartz. Leo Tolstoy famously wrote that “as long as there are slaughterhouses, there will be battlefields.” Could a world without wars result from, or coincide with, society abolishing animal exploitation? It’s not that far-fetched of a notion. Empathy is the ability to identify with the emotions of another and it is often the first step toward taking compassionate action for someone. And empathy literally transforms our brain. A 2015 Neuroimage study showed that higher empathy scores were “associated with greater gray matter density” and that people “who have high cognitive empathy are those who are more rational.” A rational state of mind is calmer and less inclined towards impulsive actions — or, in other words, aggressive and violent behavior. Rescuer Marc Ching with Lucky and Jack, who were saved from the dog meat trade in South Korea and Thailand. From LAIKA Issue Six. Photographed by Jenna Schoenefeld. One of the core aspects of a veganism is being empathetic to the pain of animals, in being able to relate to them and recognize their suffering. Compared to omnivores, functional MRI brain scans reveal a more powerful empathetic response to both human and animal suffering in the minds of vegetarians and vegans. The more we put empathy into practice, the more empathetic we become. It is nearly impossible to imagine wars still taking place once the last slaughterhouse shutters. In changing our relationship with animals, we could change our relationship with one another and pave the way to the world peace that we all long for. It’s up to us to make the dream real — through leading by example, mobilizing our communities, becoming engaged with the world around us, participating in grassroots activism. The task is more urgent than ever, particularly since our President-elect is a climate change denier who is rounding up an administration similarly hostile to the protection of animals and the environment. When relying on the government to help us is no longer an option, we still have control over whether or not we choose to participate in industries and practices that are destroying our planet and its inhabitants. And that is incredibly empowering. We already know that a benevolent existence is possible — one need only flip through the pages of LAIKA to see how abundant, vibrant and interesting a vegan life is. It is us, the masses, who hold the key to transforming our society. Our potential to cultivate positive change is limitless, and the time to begin is now. The majority of our nation’s wild horses are no longer free. They are warehoused in cramped holding facilities in order to make room for cattle farms on public lands. 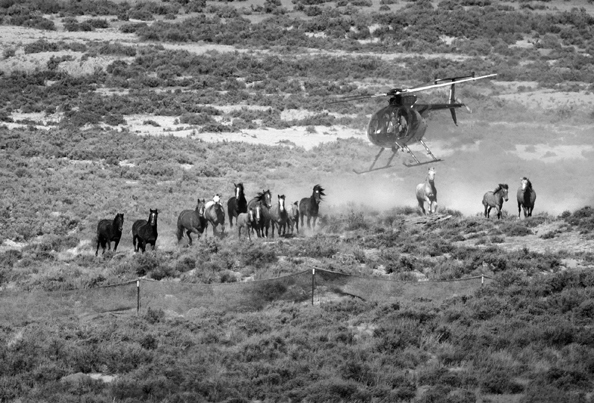 On September 9, 2016 the U.S. Bureau of Land Management’s (BLM) Wild Horse and Burro Advisory Board recommended the unthinkable: killing the 45,000 captive wild horses and burros so that 40,000 more could be rounded up in their place. Under pressure from widespread outcry, the BLM backed away on Wednesday from the panel’s recommendation. The government agency has a track record of betraying the public’s trust, however. 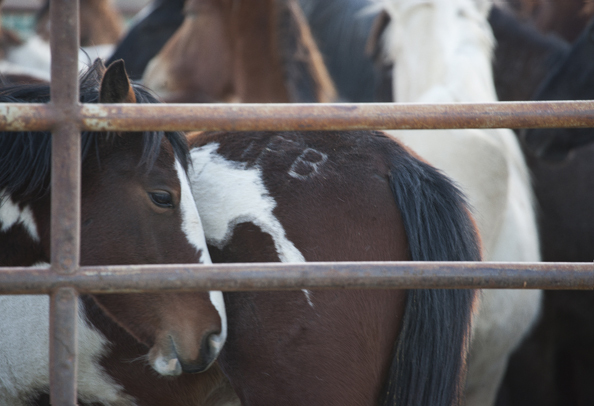 “The BLM’s intention is best exemplified by the agency’s illegal sale of 1,800 wild horses [in 2015] to a known kill buyer (all horses were slaughtered in Mexico) and its subsequent promotion and financial rewarding of the BLM employee who oversaw these illegal transactions,” the American Wild Horse Preservation Campaign stated in response to BLM’s announcement. As long as profits and cattle farmers’ interests continue to be a priority, the future of wild horses remains uncertain. As long as Americans’ infatuation with meat persists, so will the cycle of killing horses in order to kill cows. LAIKA’s Fifth Issue detailed the plight of wild horses in our exclusive report “No Home on the Range” by Mark Hawthorne. Following, is an excerpt from that report, along with a selection of images and recollections by photographer Jennifer MaHarry that accompanied it. They illuminate the suffering these magnificent animals endure during round-ups, in holding facilities and at livestock auctions. Fighting back tears, Deniz Bolbol recounts a gut-wrenching moment in her activism. As part of the nonprofit American Wild Horse Preservation Campaign (AWHPC), she was in Twin Peaks, California, documenting a wild horse roundup carried out by the U.S. Bureau of Land Management (BLM). For decades, the BLM — charged under the Department of the Interior with managing public federal lands — has been stampeding horses and burros off the landscape of 10 Western states and moving them to small pastures, where they will languish for the rest of their lives. A lucky few will find homes through the BLM’s adopt-a-horse program. Many others will die. BLM roundups are rife with controversy, but to Bolbol, nothing is more insidious about them than the taxpayer-funded tearing apart of equine families. “When the horses come into the first pen at a roundup and the family is still together, everybody’s pretty quiet,” she says. “There’s not a lot of vocalization. But when they start separating the stallions from the mares and the babies from their moms, all the horses start talking. You know they are never going to see each other again.” It’s a scene she’s witnessed many times, but in Twin Peaks with her fellow activists, she felt her heart break. You know they are never going to see each other again. “We were at the temporary holding facility. They rounded up the horses, brought them into the trap pen, separated the mares from the males and the babies, loaded them up in different trailers, and then moved them to another location with a bunch of corrals for holding until they had a semi load ready. From there, they would take them to short-term holding. We were waiting as they were bringing in horses from the trap site, and this one stallion — we called him Atticus — he would lift his head up over the other stallions and give the loudest neigh, and there would be no response. Every two or three minutes, he would stretch his neck up and give a big neigh. Nothing. Then a trailer came by. Atticus gave another neigh. This time,” she says, her voice trembling, “one of the horses in the trailer neighed back. I said, ‘Oh my god, it’s his mare!’ But it wasn’t. It was his baby. Then the next trailer came with his mare, and the three of them were neighing. We all sat there and were all in tears. It was just so sad. That experience has stayed with me as symbolic of what these horses lose.” The full feature can be found in our 5th issue. A hot, dry September day, and this herd had been relentlessly chased down by the BLM for more than an hour. They were exhausted and terrified of the noisy helicopter bearing down. This shot was the moment when they discovered there was nowhere else to run — they were being driven into a funnel-like trap leading to a pen, which led to a livestock truck. A foal who couldn’t keep up was left behind, and other horses died that day from either exhaustion or broken legs. 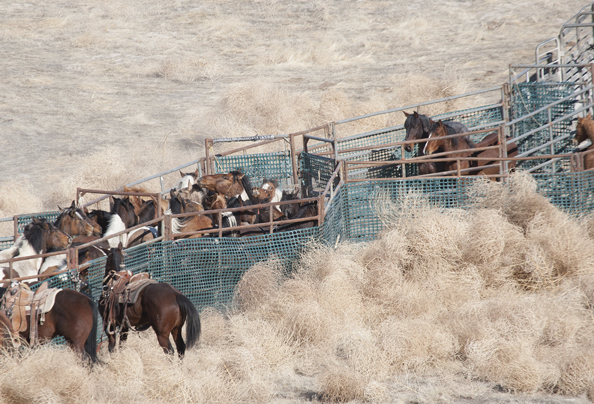 A chute-like “trap” funnels rounded-up horses toward pens that lead to a transport truck where they are culled and separated by age and gender. Within minutes, horses are transported to a government holding facility where they’re further sorted and branded or injected with an infertility vaccine. From there, they go to permanent holding where the public is no longer allowed to see them unless they go up for adoption, which happens less than 2% of the time. Any horse over 10 years old is killed. 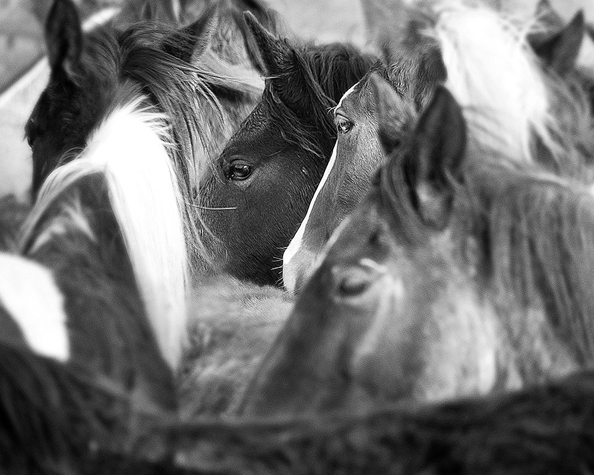 Utter hopelessness was the feeling I got from this young mustang as he nuzzled another yearling for reassurance. I recognized him from the roundup from just an hour earlier and wondered where his mother was. I had watched the BLM separate him and his mother at the trap site and witnessed their desperation to stay together at a level on par to any human mother and child being broken apart. 110 degree sweltering heat with no shade made my heart pound for two hours as I took pictures. I couldn’t fathom lasting another hour, and these horses were there day after day. 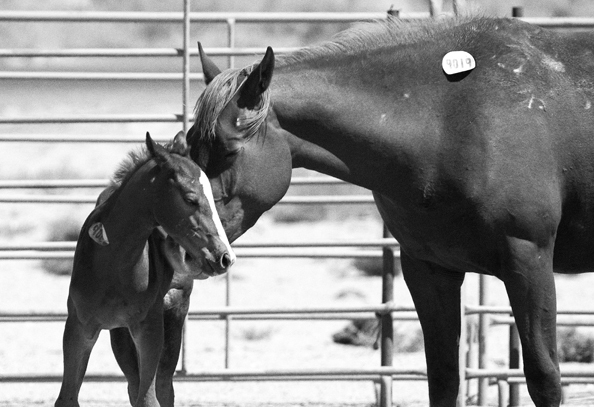 This mother and baby shared a moment before they were both auctioned off for slaughter. Nothing could prepare me for the absolute innocence, yet horrible reality, of that moment. This scene is still just as heart-wrenching to look at as it was the day I photographed it. You can help the wild horses by withdrawing your support from the meat industry, regardless of whether the meat comes from factory farms or is “humanely-raised” or “grass-fed.” Contact your representatives in Congress and tell them that you as a constituent care about this issue. Ask them to protect wild horses and not favor ranching interests. Contact the Secretary of the Interior Sally Jewell and tell her wild horses on public lands should be listed and protected under the Endangered Species Act (email feedback@ios.doi.gov or call 202-208-3100). Sign petitions and speak up for wild horses.